KCLeo12 had the most liked content! My Stage 1 is up enjoy MGS. I want to first start off by thanking Bettinardi and MyGolfSpy for this opportunity to test this beautiful putter and this style that is rapidly gaining traction on tour. Now let me tell you a little bit about me and my game. I am a scratch golfer and I play 6-8 times per month and also practice 2-3 days per week. 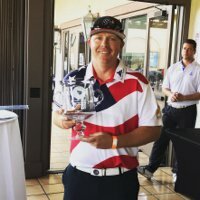 I play all types of courses in the San Diego area. I played one year of Division 2 college golf before deciding that college just wasn't for me. Something about not having to go to class just sounded so good. I was young and dumb back then but I wouldn’t change it for the world. I tried some small mini tours and did well until I injured my back which it was only recently that I found out was caused by a birth defect in my spine the lead to scoliosis. Now I play competitive golf on the Veterans Golf Association Tour as well as USGA and SCGA events. I am currently prepping to try out for the All Navy Golf Team Tryouts in mid-May. In southern California we have a vast array of types of course I play. I have a few that are by the ocean and typically softer and shorter. Then I have a few desert style firm and fast courses that I can play also. The one thing nearly all of them have in common is Poa greens. A few have bent greens but most are that scary Poa Annua they talk about on Tour. The green speed can vary greatly also from 9-13. I tend to play the Military course as they save me a good amount of money on greens fees. They are all good course nothing to challenging but they have all drastically improved their greens over the last year. A little about my game and how I attack the course. I have been a bomb and gouge guy most of my life. I competed in long drive 9-10 years ago and I was pretty long for a guy who could reasonably control the direction with the driver. After several injuries to my back and a ruptured Achilles that I never fully recovered from I focus on iron and wedge play. I still have a club head speed between 115-122 depending on how hard I want to go at it. I have always felt like I have been a pretty good putter but like most golfers I am always searching for that lightening in a bottle. I have been extremely happy with my current putter after I did a putter fitting but this arm-lock style makes so much sense to me that I have been itching to try it. It’s that constant pursuit of perfection or uncontrollable urge to get better that makes me love the game. I love that I can control how good I can be by putting more time and effort into my game. The other part is that as a golfer you have an automatic connection with any golfer regardless of their skill level. All golfers understand each other. You step on the first tee with 3 complete strangers and by the end of the round you have a very good understanding of each person and who they are. The thing all Spies want to know the most is the WITB. Most of us are gear heads and that’s likely why we are here. Driver: Cobra F9 Yellow 9* 2G forward 18G back Accra TZ5 65 M5 tipped 3/4” plays 44.75 3 Wood: PXG 0341 15* set 1.5* lower HZRDUS Yellow 76 6.5 tipped 1.5” plays 42.75 Irons: Ben Hogan FT Worth Black or new PTx Pro both have KBS Tour V 120X shafts standard length 2* flat Wedges: Ben Hogan Equalizer 50, 55, 60 KBS Tour V shafts Putter: PXG Mini Gunboat H/Scotty Cameron Newport 2 Buttonback both have the P2 Aware Tour grip at 34.5 http:// This is a putter review so let’s talk about my putting. I have a medium arc stroke but that is largely influenced by the type of putter I use. I have a slower more controlled putting stoke also. The studies with blast Motion and other types of measuring devices show a 2 to 1 stroke pace is best specifically 0.6 seconds on the back stroke and 0.3 seconds to impact. I have tried to replicate this in practice but it just doesn’t work for me, I struggle with distance control. My slower tempo is also why I prefer to die the ball in the hole. I am looking for 8-14” past the hole as my target pace. My typical miss is low side on longer putts and a push on shorter putts as I sometimes steer the ball and not release the putter face. I am extremely confident inside 10ft I feel like I am going to make every putt. I am also a very good lag putter, I rarely 3-putt due to a bad first putt. First Impressions Enough about me let’s talk about the reason you are all here the Bettinardi BB38 Arm-Lock putter I chose to go with 40.5” 5 degrees of loft and 2* flat lie angle. The first thing I noticed when I opened the box was the beautiful finish and blue paint fill. The headcover is fantastic looking and fits perfectly, the quality of the cover is probably the best of any OEM in a stock offering. The grip is a really nice corded grip that is the perfect size in the hands in my opinion but it’s not perfect. The head shape is very clean and the lines are beautiful, aesthetically its very pleasing. The 400-gram head weight and 40.5” length create a really balanced feel. Everything about this putter screams high quality. They claim that the arm-lock style helps create a more pendulum motion and eliminates the hands in the stroke. To me this style is for people that are not the best putters and becomes more of a band aid. After some quick testing the putter feels great but this style is very uncomfortable at first. I was able to get used to the feeling and roll in a few putts. But this putter will have to show a noticeable improvement in my putting for me to make the permanent switch. Will the improvements out-weigh the uncomfortable feeling over the ball? Will I make enough putts to get over the embarrassment of using an arm-lock style putter? These are some big questions I will answer in my stage 2. KCLeo12 replied to mr.hicksta's topic in What's In Your Bag?